The best car seats for toddlers for air travel might surprise you. The top seat is very inexpensive and has good owner ratings. The best seat for air travel is a different seat from the best car seat for traveling in your car. You don’t need the same features and this article will tell you why. When carrying a car seat through the airport, you want one that’s light but durable. Once you’re in the airplane you need a seat that will fit correctly and be stable. The most popular seat for air travel is the Cosco Scenera. It’s been described by some as a “bare bones” car seat so why is it preferred by many for travel? The Cosco Scenera is a very light seat as it only weighs 9.5 pounds. This is an important feature when you’re hoisting it around an airport for an hour or more. It’s also an extremely narrow seat. Most highly rated infant and children’s car seats are wider than 17 inches. 17 inches is about the maximum amount of width available in an airplane seat. The Scenera is 16.5 inches and according to many owners will fit in even smaller “puddle jumper” planes. When rating the best car seats for toddlers you need to look at how long you’ll be able to use a car seat. 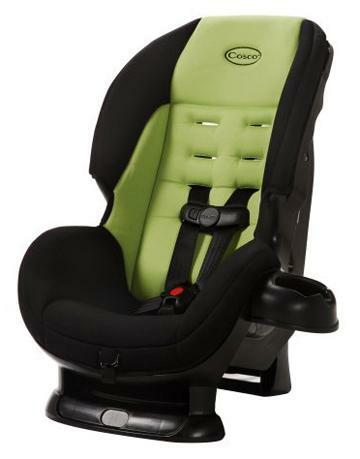 The Cosco Scenera is a convertible car seat which means it is a rear facing seat that converts to front facing after your youngster can no longer comfortably sit facing the rear. The Scenera is designed for rear facing from newborn to 35 pounds maximum. This is dependent however on the height of a child. It’s a front facing seat from 22-40 pounds again dependent on a child’s height. It’s safer for a youngster to face the rear for as long as possible. Having a car seat that faces the rear or front on an airplane seat is a nice option and you get that with the Scenera. It’s important to remember that this a pretty good seat for your car also. The Scenera like most lower priced car seats is not as comfortable for longer auto trips but it’s fine for around town and as a second seat or for grandparents to use when they’ve got the grandkids. I always recommend looking at owner reviews before buying to get an unbiased opinion about a seat. The reviews on Amazon range from those saying that the Cosco Scenera is one of the best car seats for toddlers made, to those users who think it’s a piece of junk. Like most things, the truth is probably somewhere in the middle. The fact is the Cosco Scenera has 166 customer reviews on Amazon with an overall average rating of 4 stars out of 5 stars possible. Priced at around $70 this seat should be seriously considered if you’re looking for a good, safe and solid seat for airline travel. Jerry Patterson the author of the “Best car seats for toddlers and airline travel” is an advocate for child safety and founded the car seats reviews site at Carseats-reviews.com. He investigates car seats and writes car seat reviews on those he feels are the best in their category. He’s written a recent review on the best booster seat. Light infant seats are great when traveling. I would like to see more seats with the “suitcase” feature…..a pulley handle and wheels.